A very early robotic snake called R7 was built at Hughes Aircraft and tested in May of 1987. The motors were remote from the axes being driven; power is transmitted to the joints via low force/high velocity cables. Each joint has an 11:1 reduction drive. Note that this is not a free-moving snakebot; it is more like an elephant's trunk (being attached to a controller at one end). 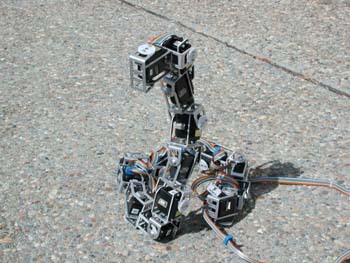 See the R7 Snake robot for more photos and information. Ames Gen 2 Snake robot heads for Mars? NASA developed the Ames Generation 2 experimental robotic snake in 2000 to help explore other worlds. This snakebot is able to independently dig in loose extraterrestrial soil and plan routes over or around obstacles. It could be ready in as little as five years, according to NASA engineers. "The key part of what we are striving for in the second snakebot version and beyond is sensor-based control in which the robot uses its sensors to decide what to do,’" Gary Haith, lead "snakebot" engineer, said. "We made two little microcontrollers, tiny computers, that we put in each hinged section that also includes a motor, electronics and gears to get the hinge to move to certain positions," he explained. It is hoped that the snake robot can save spacecraft weight; the snake-like design enables the robot to do many tasks without much extra equipment. 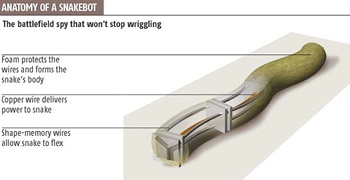 "One of the many advantages of the snake-based design is that the robot is field-repairable. We can include a bunch of identical spare modules with the snake on a space mission, and then we can fix the snakebot much easier than a regular robot that needs specific parts," said Haith. "Other benefits are: the snakebot can crawl off a spacecraft lander and doesn’t need a ramp, the snake's moving parts can be sealed inside artificial skin to avoid exposure to the outside environment and the robot can still function, even if one joint freezes." This prototype military reconnaissance robot was designed in 2003 to be dropped from a helicopter, and then creep around the battlefield, spying on the enemy. In theory, it would be less obvious than any kind of wheeled vehicle. It was also designed to be self-repairing. If any of its segments become damaged, the software works to "evolve" a way to continue its mission. It also has a shape-changing antenna to broadcast audio and video. Each segment has three individual "muscles" made ofa shape-memory alloy called nitinol running down its length. When a current is applied to particular wires, the crystal structure of nitinol shrinks, shortening those wires. When the current is removed, the wires snap back into shape, wriggling the snakebot forward. Read more about it at Self-healing snake robot. Go to Snake Robot Roundup: Part Two.